This ‘runseeing’ tour of Naples is best done early. 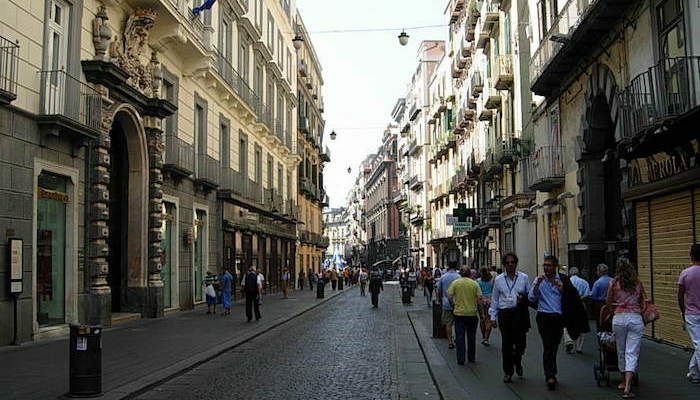 Sure, the streets of Naples are cramped and narrow, but that’s part of the city’s charm! Nowhere is this more true than Old Town Naples, with its winding cobblestone streets, adorable shop fronts, and brimming historical architecture including churches, piazzas, and palazzos. We’ve tried to design a ‘runnable’ route that minimizes turns and directions. Start at Piazza Vittoria and head north on Via Chiala towards Palazzo Partanna. At Fontana del Carciofo, turn LEFT onto Via Toledo which runs through Quarter Spagnoli into Old Town. At Palazzo Carafa di Maddaloni, turn RIGHT onto Via Domenico Capitelli and run through the length of the neighborhood. Bear LEFT on Coletta and turn LEFT on Tribunali to double back through the sights of Old Town. Use Toledo to return back to Piazza Vittoria. For add-on or variety, enjoy the twists and turns of the narrow streets between Via Toledo and Corso Vittorio Emanuele.